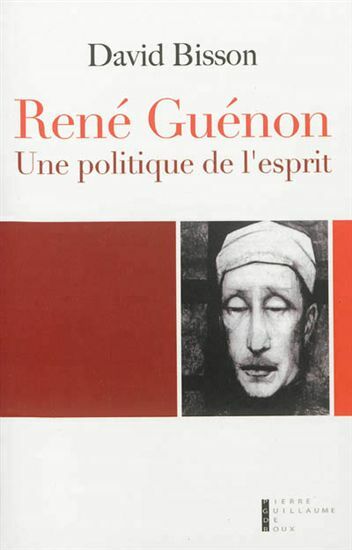 Just out: a new French book on Guénon, David Bisson's René Guénon: Une politique de l'esprit (Paris: Pierre-Guillaume de Roux, 2013), 528 pp., €29.90. Bisson, one of whose articles has already been noted by this blog, is an academic, and defended a PhD thesis in political science on Guénon in 2009, "Une politique de la Tradition au XXème siècle. Fondements et usages de la pensée de René Guénon (1910-1980)". His book reflects his politicalogical interests. It is divided into four parts. First comes "Tradition in theory" (1910-32), then "Tradition in practice" (1930-51), then "Tradition in perspective" (1951-80) and finally and more briefly "Tradition today" (1980-2000). Technically, the fourth part is the closing section of the third part. "Tradition in theory" sees Guénon's early life as "genesis" (gnostic intuition), "incarnation" (Oriental exposure) and "synthesis:" esoteric reason. Then comes "Tradition as metapolitical project," proceeding from a "metaphysics of history" (the end of the modern world) to a program of "intellectual" reform. This section ends by asking how Guénon should be placed politically, and suggests that he should be understood as a modern despite himself--perhaps at the avant-garde of modernity--and as belonging to the Counter-Enlightenment, to extreme conservatism ("reaction"), and to the Right. "Tradition in practice" looks first at Guénon's life from 1931, and then at Traditionalism in politics, focusing on Evola, Eliade, Carl Schmitt, Pierre Drieu la Rochelle, and Simone Weil. This section ends by asking how the movement that Guénon inspired should be understood, and suggests that it should be seen as an intellectual community positioned between esotericism, politics and spirituality, and as a coherent ideology, but one that asks for initiatic realization rather than political engagement. "Tradition in perspective" looks at the major streams of Traditionalism after 1951 in terms of the "regular" Traditionalism of Schuon, Vâlsan, and Maridort, the "gnostic perspectives" of Eliade, Henry Corbin, Gilbert Durand, and Eranos, and the "anti-modern metapolitics" of Raymond Abellio, Louis Pauwels, Evola and the New Right. "Tradition today," finally, looks briefly at the "reconfiguration of the Traditionalist space" (current French Traditionalist journals, Pallavicini), the "new reception of Traditionalism in the academic field" (Jean Borella and contemporary French academics such as Éric Geoffroy), and "re-readings of Traditionalism in the metapolitical space" (the New Right). The book covers the standard ground well, then, and also adds some new perspectives, both analytically and in terms of (mostly French) figures who are often understudied or ignored in connection with Traditionalism (not least by myself! ): Carl Schmitt, Drieu la Rochelle, Simone Weil, Corbin, Durand, Abellio, Louis Pauwels, and Jean Borella. The book's vision is distinctly Franco-centric, but then this is hard to object to in a French book! 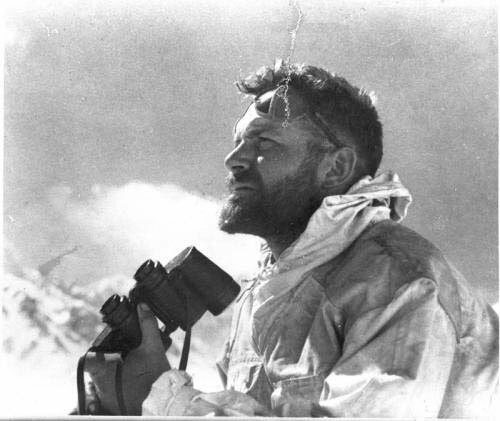 Isrun Engelhardt, the historian of Ernst Schäfer's 1938-1939 German expedition to Tibet, has published an interesting and entertaining article, "Nazis of Tibet: A Twentieth Century Myth," on info-buddhism.com. Engelhardt looks at the origins of the "alleged Nazi-Tibetan connection" from Heinrich Neuhaus in 1618 (sic) to Louis Pauwels and Jacques Bergier, mentioning Guénon's Le Roi du Monde (1927) in passing, and compares these to what is known of the Schäfer expedition from the primary sources she has studied. Conclusion: no real Nazis in Tibet.